Regular readers will know that I've been interested in the so-called Teller-Ulam mechanism used in thermonuclear bombs. Recently I read Kenneth Ford's memoir Building the H Bomb: A Personal History. Ford was a student of John Wheeler, who brought him to Los Alamos to work on the H-bomb project. This led me to look again at Richard Rhodes's Dark Sun: The Making of Hydrogen Bomb. There is quite a lot of interesting material in these two books on the specific contributions of Ulam and Teller, and whether the Soviets came up with the idea themselves, or had help from spycraft. 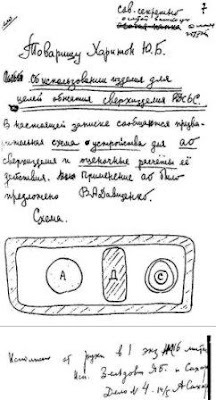 See also Sakharov's Third Idea and F > L > P > S.
The power of a megaton device is described below by a witness to the Soviet test. The Teller-Ulam design uses radiation pressure (reflected photons) from a spherical fission bomb to compress the thermonuclear fuel. The design is (to quote Oppenheimer) "technically sweet" -- a glance at the diagram below should convince anyone who understands geometrical optics! It is my judgment in these things that when you see something that is technically sweet, you go ahead and do it and you argue about what to do about it only after you have had your technical success. -- Oppenheimer on the Teller-Ulam design for the H-bomb. What is technically sweet about genomics? (1) the approximate additivity (linearity) of the genetic architecture of key traits such as human intelligence (2) the huge amounts of extant variance in the human population, enabling large improvements (3) matrices of human genomes are good compressed sensors, and one can estimate how much data is required to "solve" the genetic architecture of complex traits. See, e.g., Genius (Nautilus Magazine) and Genetic architecture and predictive modeling of quantitative traits. More excerpts from Dark Sun below. Enthusiasts of trans-generational epigenetics would do well to remember the danger of cognitive bias and the lesson of Lysenko. Marxian notions of heredity are dangerous because, although scientifically incorrect, they appeal to our egalitarian desires. The transmission of crucial memes from Szilard to Sakharov, across the Iron Curtain. Andrei Sakharov stopped by Victor Adamsky's office at Sarov one day in 1961 to show him a story. It was Leo Szilard's short fiction “My Trial as a War Criminal,” one chapter of his book The Voice of the Dolphins, published that year in the US. “I'm not strong in English,” Adamsky says, “but I tried to read it through. A number of us discussed it. It was about a war between the USSR and the USA, a very devastating one, which brought victory to the USSR. Szilard and a number of other physicists are put under arrest and then face the court as war criminals for having created weapons of mass destruction. Neither they nor their lawyers could make up a cogent proof of their innocence. We were amazed by this paradox. You can't get away from the fact that we were developing weapons of mass destruction. We thought it was necessary. Such was our inner conviction. But still the moral aspect of it would not let Andrei Dmitrievich and some of us live in peace.” So the visionary Hungarian physicist Leo Szilard, who first conceived of a nuclear chain reaction crossing a London street on a gray Depression morning in 1933, delivered a note in a bottle to a secret Soviet laboratory that contributed to Andrei Sakharov's courageous work of protest that helped bring the US-Soviet nuclear arms race to an end. Not long ago I was surprised to learn (on Lubos Motl's blog) that most of the explosive power of an H-bomb derives from the Uranium, not the Hydrogen. What happens is that the A-bomb (uranium) ignites the Hydrogen which then reacts back on the Uranium, raising its temperature and pressure and in the process producing a much more efficient uranium explosion. Does this accord with your understanding? I almost never hear it explained that way -- in fact never, except for Lubos. "What then happens when the fission bomb “match” explodes? Its radiation runs out ahead of its expanding material and almost instantaneously vaporizes the polyethylene, creating a very hot plasma. The pressure of this plasma adds to the pressure of the radiation, pushing outward on the outer steel cylinder and at the same time inward on the uranium cylinder, thereby keeping the channel open long enough to let more radiation stream in. At the same time, the outer layers of the inner cylinder “ablate” (boil off), creating even more inward pressure. Before long—within microseconds—an inwardly imploding shock wave has compressed and heated the cylindrical container of deuterium and also, through compression, caused the plutonium sparkplug to go critical. The sparkplug, which is really another fission bomb, helps to ignite and then enhance the deuterium burning—hence the name “sparkplug.” Finally, energetic neutrons emitted in the thermonuclear burning (especially those of 14 MeV from the DT reaction) cause fission in the ordinary uranium that surrounds the deuterium as well as more fission in the sparkplug. Altogether quite a maelstrom. So this “H bomb” is really one part fusion and three parts fission. Its total energy release (its “yield”) is estimated, in fact, to have come about three-quarters from fission and one-quarter from fusion." Thanks. That's quite an illustration.